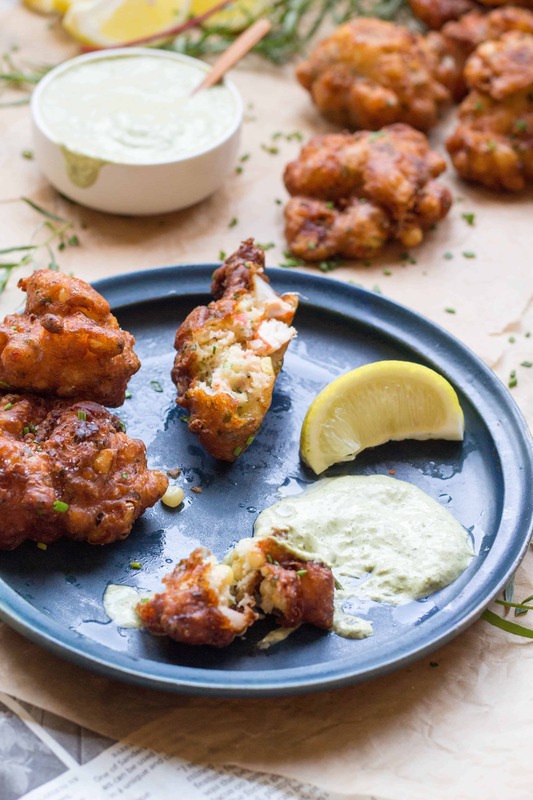 This easy recipe for Lobster Corn Fritters with Tarragon Aioli is one of the tastiest ways to enjoy fresh lobster aside from just dunking it in butter! 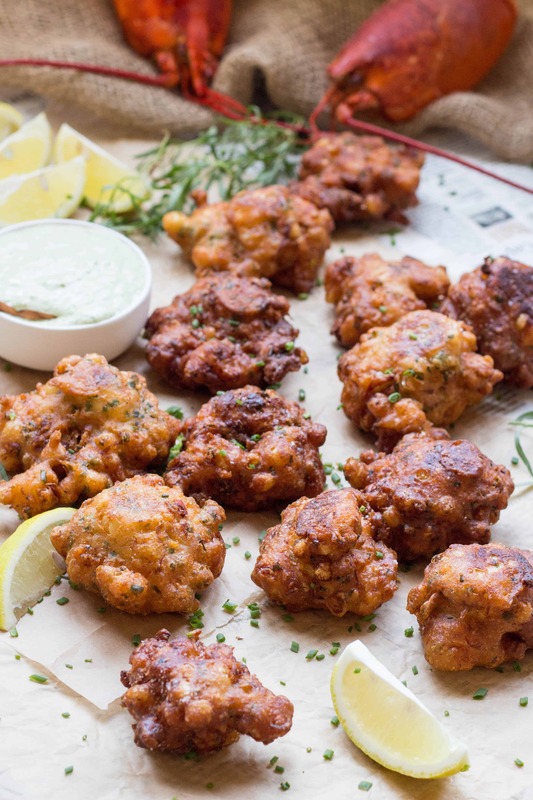 Lightly fried batter with big chunks of lobster and fresh sweet corn. The best summer appetizer ever! When it comes to lobster, it really doesn’t get any better than eating them freshly steamed and whole. There’s nothing like gathering around with a bunch of friends and cracking them open with lots of melted butter and lemons for dipping and squeezing. Preferably outside, on a big newspaper-lined picnic table. Corn on the cob optional. And it better be messy, with shells and juices flying all over the place. Bonus points if there’s a cool dog around to lick up all the scraps. Of course, there are certainly plenty other ways to enjoy lobster, and I love each and every one of them. But I find it to be almost sacrilegious to enjoy a freshly cooked lobster any other way than stated above. Any other preparation is perfectly fine made with day-old lobster leftover from said lobster feast. In fact, I think it’s much better that way. Steam the lobsters one night and just enjoy them as-is. They deserve that much. 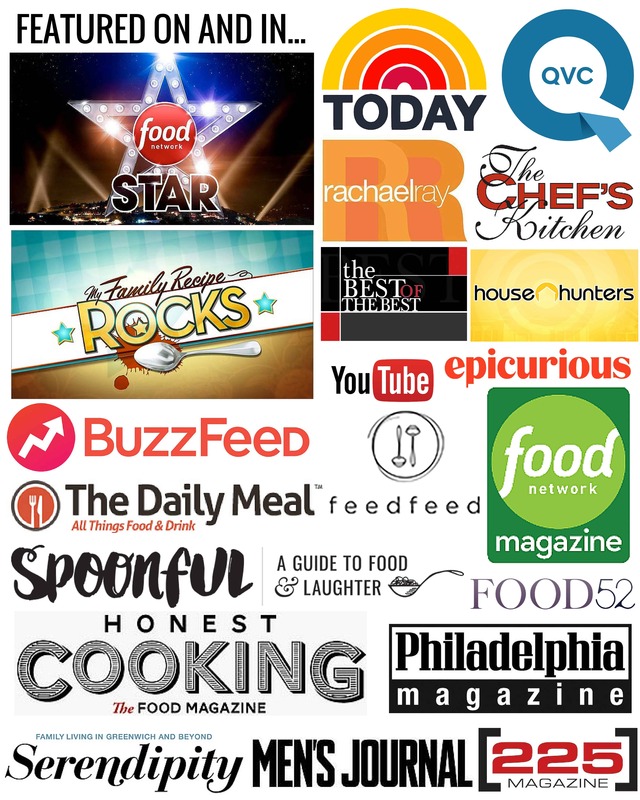 But always, always, always make sure you have extras so you can whip up something equally as amazing the next day. That, my friends, you most definitely deserve. 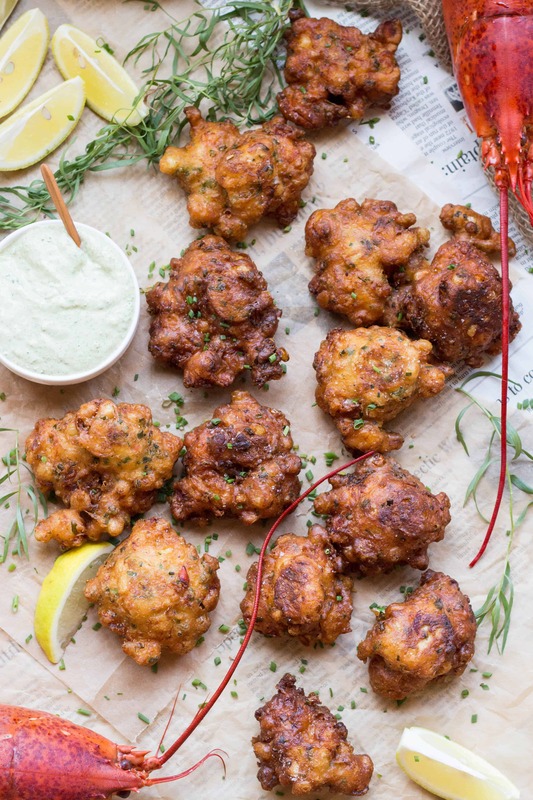 These lobster corn fritters are the ultimate summer appetizer to share with friends… err… well… or to hoard all to yourself like the greedy cook that you are, and then feel like crap immediately after because you just ate an entire batch of fried dough. Don’t do that. Don’t be like me that person. Share. Share, share, share. You’ll be so much happier if you do, and hey! So will your friends. Fresh, sweet summer corn is such a perfect pair for succulent, juicy lobster. That’s why you always see them together. It just works. It’s one of those classic combos. 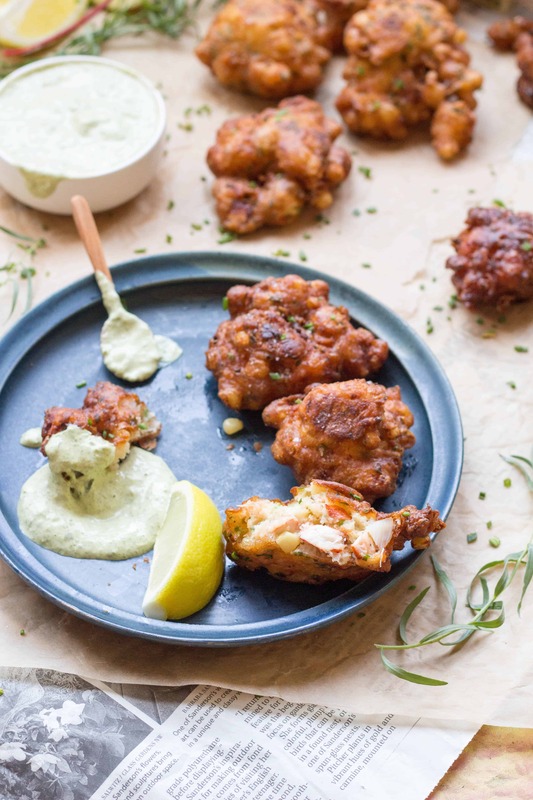 Nestled into a light, savory dough and fried until golden brown and crisp, these fritters are wonderful on their own, but even better when dipped into this creamy, lemony tarragon aioli. Tarragon just so happens to be another one of lobster’s BFF’s. It’s something I always add to my lobster bisque, and you’d never even know it’s there. Tarragon has a somewhat licoricey flavor, which is why a lot of people don’t like it. And personaly, I hate licorice, but I absolutely love tarragon when used in the right application. When paired with lobster, tarragon actually enhances the flavor and makes whatever you’re cooking actually taste more, well, lobstery. 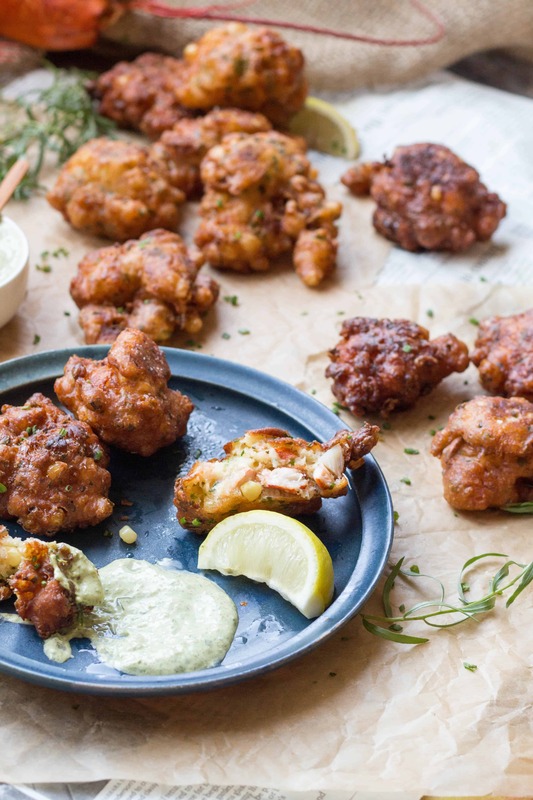 It’s pretty magical, and it’s why this sauce pairs up so perfectly with these fritters. That said, if you’re really adamantly opposed, you can always substitute basil, which would be equally as nice. Luscious lobster. Summer corn. Crispy fried dough. Tangy dipping sauce. Warm evenings. Family. Friends. Happiness. 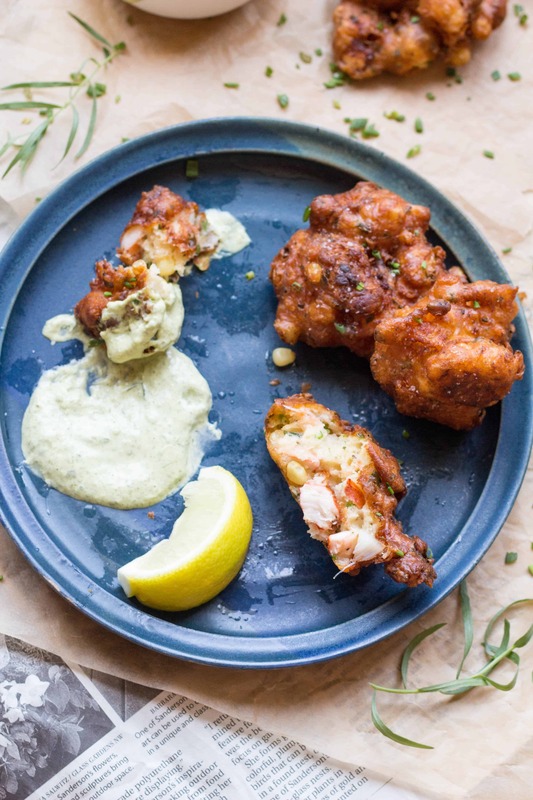 Combine the tarragon, garlic, lemon juice and mayonnaise in a food processor and blend until the tarragon is completely broken down and the color turns pale green. Season with salt and pepper, then set aside. Whisk together the flour, corn starch, baking powder, baking soda and salt. Add the buttermilk and egg, then whisk until just combined. Gently fold in the lobster, corn and chives, then set aside. Heat 1-2 inches of oil in a large saucepan with high sides over medium heat. Test a small piece of batter first to see if the temperature is right. It should sizzle, but not furiously, and it should not drop to the bottom of the pan. 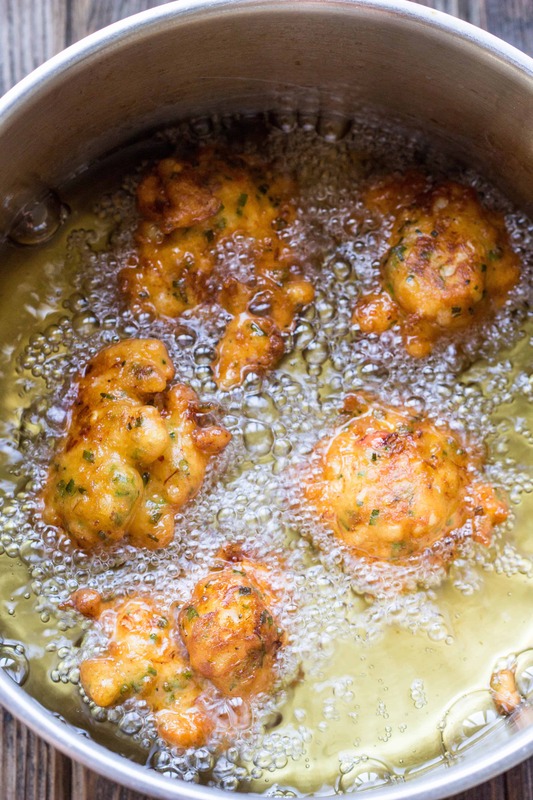 When the oil is ready, drop 4-5 generous spoonfuls of batter into the hot oil and fry, turning once, until golden brown. Remove with a slotted spoon and drain on paper towels. Sprinkle immediately with salt, then repeat with the remaining batter. Serve immediately with tarragon aioli and lemon wedges on the side. YUMYUMSUE@AOL.COM! And I concur that this should ONLY be used with leftover lobster. I currently have about 20 leftover cooked crabs and am considering using basic recipe but instead of tarragon, would you use Old Baby or something else in the aioli? Ohhh you’re in Maryland this week, aren’t you?? Awesome. Substituting crab is an excellent idea, as is the old bay!!! I say go for it, and report back!!! I bet they’ll be wonderful. Enjoy! OMG these sound amazing. I am such a sucker for fritters made with corn and some kind of seafood… Recently had crab and corn, and they were so good. Definitely can’t go wrong with the lobster and corn combo! 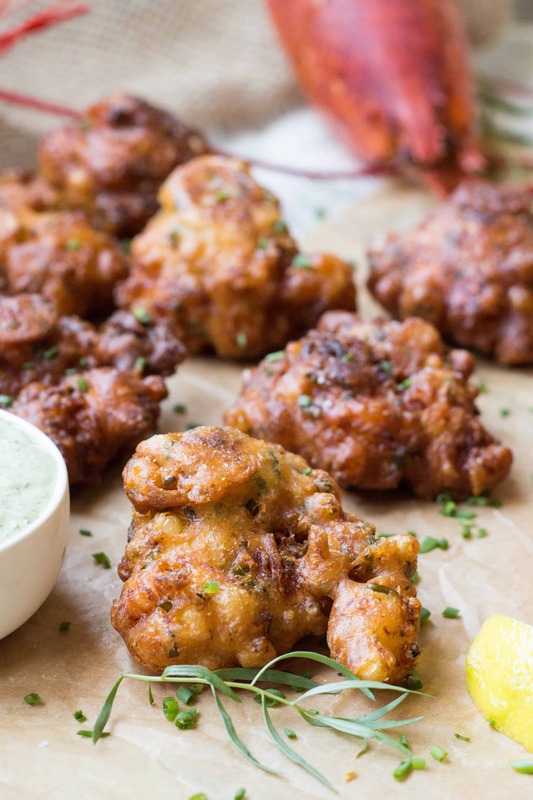 What a great summer seafood appetizer — or actually, I could make a meal out of this for sure. Thanks Shaina!! These are totally right up your alley. Mmmm, the crab sounds awesome, I want to try that next! You can’t go wrong. You’re killing me with this one, Coley! I wish I was back in Gloucester, aka lobster and corn heaven. Definitely going to hook it up next trip. Ahhh!!! These look like little fried bites of Summer! Fantastic work as always! Thanks, Francesca!! You hit the nail on the head. SO good! OMG Coley!! These look insane! Your photos make me want to grab one right off my screen! I love the tarragon aioli! I can’t wait to try! Thank you!! They are beyonnnnnd delicious. With lobster and sweet corn, how could you possibly go wrong? !